Oscar learned how to kneel down! Oscar rarely kneels down naturally, but it’s really cute when he does. I was looking for a new trick to teach Oscar, and I was intrigued by the challenge of training him to kneel down on command. I knew it would be more difficult than some of the other mini pig training I’ve done with him, but it seemed like a fun challenge. Also, a mini pig kneeling down is an adorable trick to show off to family and friends! Here is the video on how I taught Oscar to kneel down. This trick was more challenging for me than it was for Oscar. Since he doesn’t kneel down often, I had to figure out how to purposefully make him kneel down in order to train him to do it on command. I tried everything from attempting to shape him into kneeling down to putting a treat near the ground to see if he would lower himself to get the treat. The first few training sessions were really frustrating because I couldn’t even get him to kneel. Then, one day I took a warm blanket out of the dryer and set it on the floor for Oscar to nap on, and he naturally knelt down on it. I ran and grabbed my clicker and tried the training again. With the warm blanket on the floor, Oscar happily knelt down, so I was able to finally get him to kneel long enough to click the behavior and then he learned the trick quickly from there. You might have to get a little creative to teach your mini pig to kneel down. If you know of a particular time when your mini pig naturally kneels down, use that to your advantage. Go to where your pig likes to kneel, take your clicker and treats, and do your training there. Once your mini pig kneels down, say “down” and click the clicker to signal to your mini pig that kneeling means down and is rewarded with a click and a treat. If your mini pig is like Oscar and doesn’t kneel often, try using a warm blanket to see if you can get her to kneel. If she does, have your clicker and treats ready. 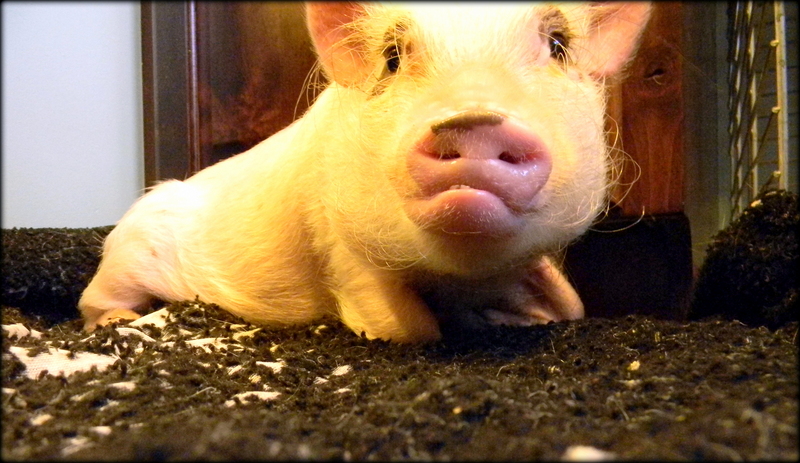 As soon as your mini pig kneels on the blanket, say “down” and then click and give her the treat while she’s kneeling. Eventually, your pig will learn to kneel on command and without the warm blanket, but you might need it at first in order to get your pig to kneel long enough to click and reward the behavior. This is a more challenging trick, so I don’t recommend this for the first time you train your mini pig. If you are just starting with training your pig, I highly recommend starting with circle and building up to other tricks like sit, shake, and stay. Circle is my favorite starter trick for mini pig training because it’s fairly quick and easy, and it’s really fun for both the mini pig and owner. Once your pig has figured out the training process and understands the clicker, other tricks become easier and less frustrating to train. As always, keep your training sessions short. A few training sessions each day, ideally just a few minutes long, are much more effective than longer, less frequent sessions. If you or your pig starts to get frustrated during training, cut that session short and try again later. Keep the mini pig training fun! If you want to know more about why I use a clicker for mini pig training or what treats I use to train Oscar, check out my mini pig training basics post and video. He’s so cute. He just kneels down without you saying anything hoping to get a treat. Elmer automatically does a circle or shake before every meal. I don’t have to say anything. Funny pigs. I have been teaching my piggy to kneel too. I call it a “bow.” I sat on the floor and and had Fiona sit between my legs. I put the treat under my leg and she naturally kneeled to get the treat. As soon as she kneels I tell her good bow and give her the treat. It’s worked like a charm and I don’t have to get anything out except my cheerios. We are thinking of getting a mini pig.. I’m a little intimidated on how to take care of one..are they really ok to be indoor.. how much work are they to take care of. Any advice on a new pig to be mommy? Hi Erica! I think it’s great that you’re thinking through all of this. Pigs are rewarding pets, but they are also a lot of work. In my experience, Oscar is somewhere between a dog and a toddler in the amount of work and attention required. Oscar does ok indoors, but he does need outdoor rooting time. Since rooting is a natural behavior, it’s something they need to do and will resort to other forms of entertainment when not allowed enough outdoor time. Unfortunately, this can mean more destructive behaviors like rooting up floors, getting into things, chewing on walls, etc. I’ll be completely honest in that Oscar takes up a lot of my time. Most days, I am completely fine with that, but there are also days when I worry that he’s not getting enough attention. I always encourage people to really think about the day-to-day with a pig because their cuteness can be distracting, and also make sure you have someone around you that you can trust to watch your mini pig if you ever want to travel. That’s been an issue for us. There’s a group on Facebook called Pre Loved Pigs, and it’s a rehoming page for pigs. Even if you’re not considering a rescue, it’s a great place to look to see why people are giving pigs away and it will help you see some of the challenges. My point isn’t to discourage you at all, but it will help you get both sides of mini pig ownership before making your final decision.